iOS 12 rolls out to all this fall. iOS 12 is shaping up to be one biggest software updates Apple’s ever released and it’s so stuffed with major and minor new additions there wasn’t time to go over a lot of them at the WWDC 2018 keynote. We’ve been combing through the first iOS 12 beta looking for all the new goodies and have found some underrated new features that will totally change how you use your iPhone and iPad this fall. 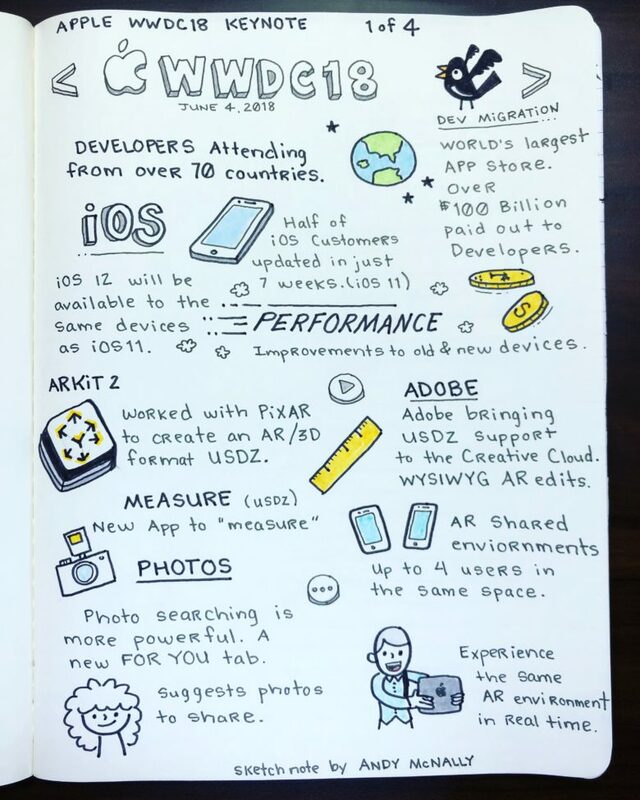 Sketchnotes deliver all the WWDC 2018 keynote highlights the easy, visual way. It is always exciting to capture the WWDC keynote in sketchnotes, and this year I filled up four pages of my notebook with drawings showcasing the biggest new features coming in iOS 12, macOS Mojave and watchOS 5. As seen in my first sketchnote, above, iOS 12 makes performance on both old and new devices a priority. ARKit 2 brings more augmented reality goodness to Apple devices, including the ability for up to four people to share the same AR space at the same time. For a quick and easy recap of the rest of the WWDC 2018 keynote highlights — plus a bonus sketchnote that proved kind of prescient — check out the rest below.